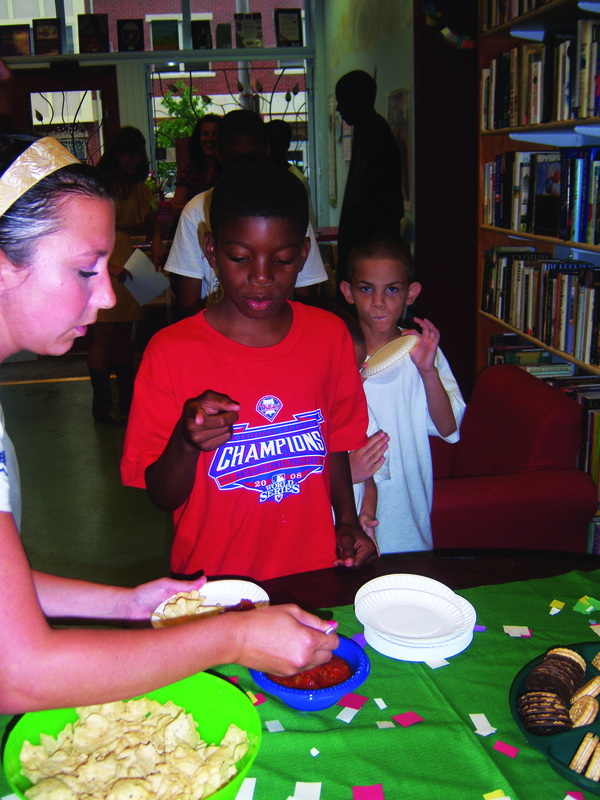 REBECCA BLEZNAK TTN Volunteers come to Tree House Books to experience a different outlook on North Philadelphia. And Tree House Books is more than a bookstore. It’s a place for local children of all ages to go to learn, evidenced through a number of Tree House’s programs – the most popular being Tutoring Time, which runs every Tuesday through Friday, 3 p.m. to 5 p.m. During Tutoring Time, kids work on their homework, play games, eat healthy snacks and, of course, read. Volunteers, made up mostly of Temple students, volunteer their time to the bookstore and the kids. “As the only two paid staff members, Mike [Reid] and I rely on volunteers to make it from day to day,” said Executive Director Darcy Sebright. Sebright handles behind-the-scenes work, like grant writing. Reid is the program coordinator, so he sets up Tutoring Time, Magazine Workshop, International Nights and more. Both staff members began years ago as volunteers: Sebright started in 2006, and Reid joined in 2008. But they aren’t the only ones who keep coming back. “The moment I [first] entered Tree House Books, something just seemed to click,” said Danielle Mancinelli, a senior English and political science major who has been volunteering at Tree House since she was a freshman. Mancinelli became an intern and a vital part of the nonprofit’s structure. She has helped implement a number of successful programs, such as the Tree Shade Summer Program, in which Mancinelli, Sebright and Reid, along with volunteers Hali Baumstein, Liz Earnshaw and Lauren Macaluso, guided some neighborhood kids through art projects and writing exercises and took them on a number of field trips. Campers were able to meet the son of former mayor John Street, Shareef Street, and interviewed him about growing up in North Central Philadelphia. With the help of the staff and volunteers, the students created a podcast, which is available for listening at the Tree House Web site. “I had never spent much time in North Philly, and I felt like I learned so much about the neighborhood and the kids living there,” said Baumstein, a junior creative writing major at Hamilton University. “I also enjoyed helping the kids do things they wouldn’t normally get to do, like interview people, go on field trips and create everything from podcasts to elaborate art projects. I saw a lot of kids really come out of their shells and try new things which was so cool, especially when they happened to find something they were really good at,” said Baumstein, who lives in the suburbs and commutes every day to volunteer at Tree House. So why do volunteers keep coming back to Tree House? Recent Temple grad sStar Bocasan, who now serves on the Board of Directors for Tree House, said she loves making a difference through her involvement with Tree House and seeing progress in the children as they learn. Rebecca Bleznak can be reached at rebecca.bleznak@temple.edu.